That's crazy, bears really jumped on that. I would have normally looked at that as a pull back to buy after such a strong move. glad I didn't step in front of that. Hope everyone has a great trading day ahead! 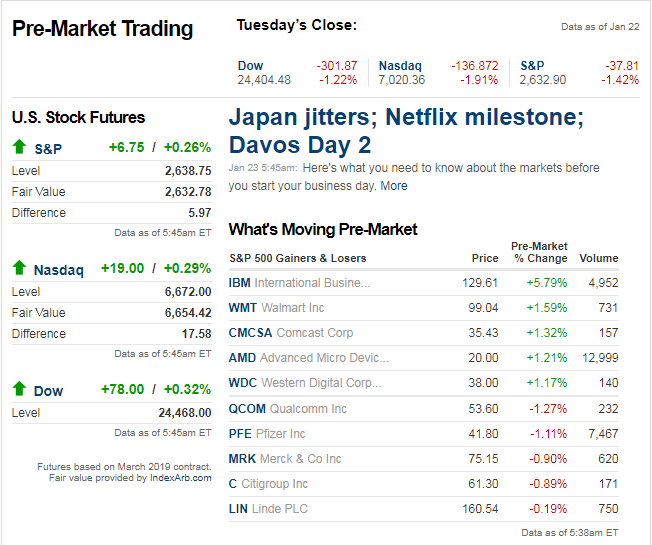 Solid earnings news from companies like IBM, UTX, and PG are putting traders in a buying mood this morning sending futures up by about 0.40%. Even after yesterday’s last hour rally of 0.60%, the S&P 500 still managed to finish down over 1% on the day. What makes yesterday’s decline unique, though, is that it came as volume was below average. In other words, there was hardly a rush for the exits. For example, volume in SPY was 13% below its 50-day average, coming in at under 110 million shares. 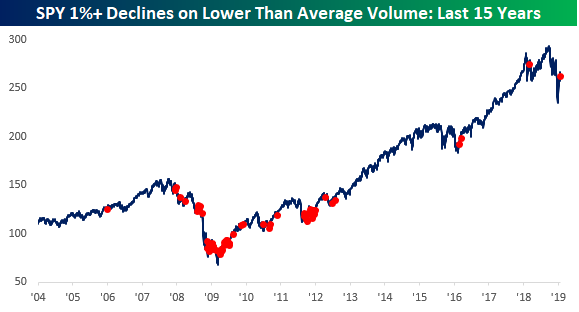 The last time the S&P 500 was down 1%+ and volume was more than 10% below average was almost a year ago in late February 2018. Between then and now, there have been 28 other days where the S&P 500 was down over 1% where volume was higher relative to its 50-day average. The chart below shows the performance of SPY over the last 15 years, and the red dots indicate each time where the S&P 500 dropped more than 1% on volume that was at least 10% below average. As shown, there haven’t been many of them in recent history. Before the last occurrence in February 2018, you have to go all the way back to early 2016 to find the next most recent occurrences. 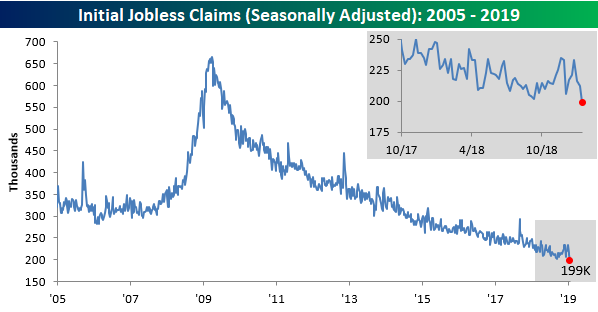 Before that, there were many occurrences during the financial crisis and the first several years of the bull market, but they were a lot more frequent as the market was rallying than they were during the downturn. I love these down days, imo they trade so much more technically dependable than green days. 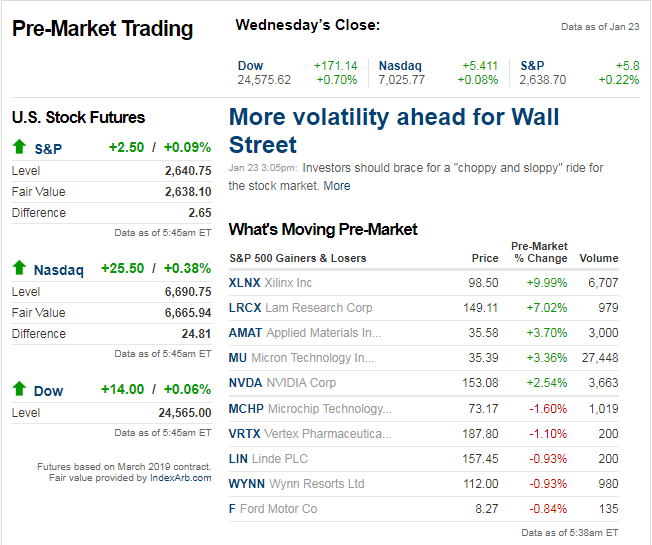 DOW outperforming since PG, UTX, and IBM are all up pretty nicely after their earnings. Looks like emerging market outperforming too on the weaker dollar. Semis were supposed to be out of favor, weren’t they? That’s not the case this morning, though, as positive earnings reports from Texas Instruments (TXN), Lam Research (LRCX), Xilinx (XLNX), and Teradyne (TER) are pushing the semiconductor group higher by over 2.5%. The rally in US equities has taken a bit of a breather in the last couple of days as investors try to digest the gains off of the Christmas Eve lows. With the rally on pause for the time being, we wanted to take a quick moment to compare the performance of S&P 500 industries so far in 2019 (x-axis) to their performance in Q4 of 2018 (y-axis). While there are most certainly exceptions, there is a pretty clear trend where the areas of the market that worked in Q4 haven’t really worked all that well in 2019, whereas the industries that were the hardest hit in Q4 have outperformed so far in 2019. 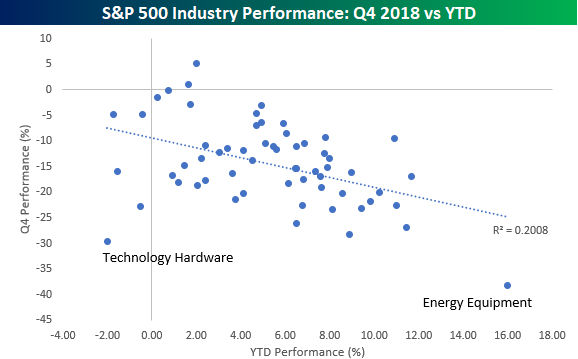 A perfect example is the Energy Equipment Industry, which was the worst performing S&P 500 industry in Q4 (-38%) but has been the best performer so far this year (+16%). One exception? Technology Hardware. In Q4, the industry was down 29.5%, but this year it has also declined, falling 2%. You can thank Apple (AAPL) for that. Yeah its probably accurate, but that is what happens when you need three jobs to pay the bills. Looks like lots of earnings misses today. Good TGI Friday to all. Hope everyone a great trading day ahead on this final trading day of the week! Despite a 6% decline from Intel (INTC) in reaction to its Q4 earnings report, US equity futures are looking to close out the week on a positive note. 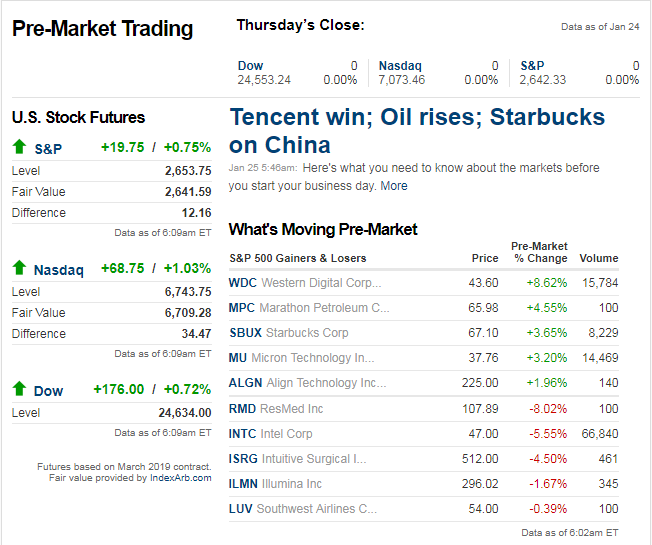 These gains follow strong showings in both Asia overnight and Europe this morning. Breaking downtrends. That seems to be the theme of this week as a number of charts we go through show similar patterns of breaking the short-term downtrends of the fourth quarter. Granted, longer-term downtrends remain in place, but you have to start somewhere! The example we wanted to highlight this morning is Europe’s STOXX 600. As shown in the chart below, after a brief consolidation following the upside break of the 50-DMA, today’s rally has pushed the STOXX 600 above the short-term downtrend that has been in place since last Fall. Just posting this in here as well in case I can't get a chance to do it later today. 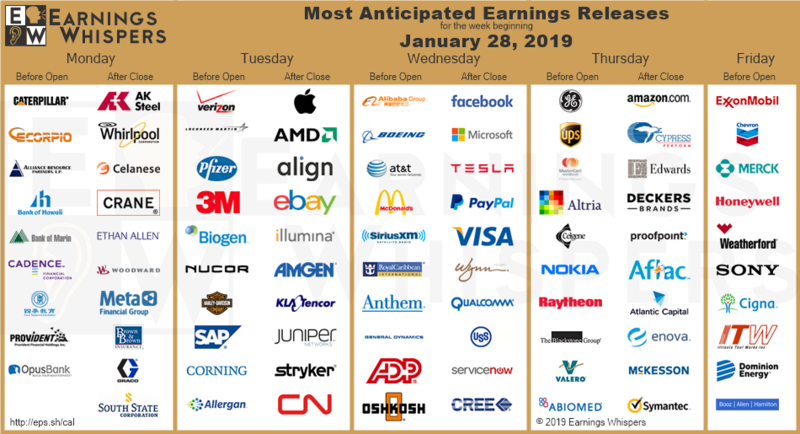 Earnings season really begins to ramp up in a big way from next week! Here's Earnings Whispers most anticipated for the week ahead.